Some of the patches marked for 2.4 were left out of 2.4.0. Please use 2.4.1. For more information on what fixes have been backported to 2.4, see our detailed release info. For more information on what fixes have been backported to 2.3.1, see our detailed release info. For more information on what fixes have been backported to 2.3, see our detailed release info. For more information on what fixes have been backported to 2.2, see our detailed release info. IPython 2.1 is the first bugfix release for 2.0. For more information on what fixes have been backported to 2.1, see our detailed release info. IPython 2.0 requires Python ≥ 2.7.2 or ≥ 3.3.0. It does not support Python 3.0, 3.1, 3.2, 2.5, or 2.6. The amount of work included in this release is so large that we can only cover here the main highlights; please see our detailed release statistics for links to every issue and pull request closed on GitHub as well as a full list of individual contributors. 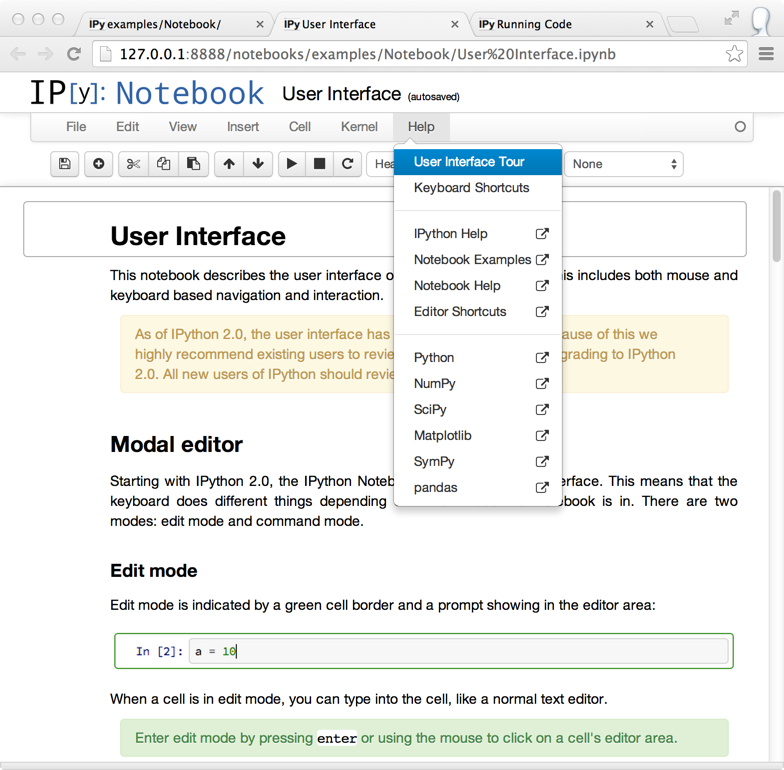 The IPython notebook dashboard allows navigation into subdirectories. URLs are persistent based on the notebook’s path and name, so no more random UUID URLs. Serving local files no longer needs the files/ prefix. Relative links across notebooks and other files should work just as if notebooks were regular HTML files. IPython 2.0 adds IPython.html.widgets, for manipulating Python objects in the kernel with GUI controls in the notebook. IPython comes with a few built-in widgets for simple data types, and an API designed for developers to build more complex widgets. See the widget docs for more information. The notebook has added separate Edit and Command modes, allowing easier keyboard commands and making keyboard shortcut customization possible. See the new User Interface notebook for more information. You can familiarize yourself with the updated notebook user interface, including an explanation of Edit and Command modes, by going through the short guided tour which can be started from the Help menu. Trust is determined by signing notebooks. Untrusted HTML output is sanitized. The dashboard now has a “Running” tab which shows all of the running notebooks. IPython previously supported Python 3 by running 2to3 during setup. We have now switched to a single codebase which runs natively on Python 2.7 and 3.3. For notes on how to maintain this, see Writing code for Python 2 and 3. Deprecate single-format InlineBackend.figure_format configurable in favor of InlineBackend.figure_formats, which is a set, supporting multiple simultaneous figure formats (e.g. png, pdf). This is available at runtime with the new API function IPython.display.set_matplotlib_formats(). There is no longer a 500ms delay when calling clear_output. The ability to clear stderr and stdout individually was removed. A new wait flag that prevents clear_output from being executed until new output is available. This eliminates animation flickering by allowing the user to double buffer the output. The output div height is remembered when the wait=True flag is used. Some configurable traits are containers (list, dict, set) Config objects now support calling extend, update, insert, etc. on traits in config files, which will ultimately result in calling those methods on the original object. Scripts run on the command-line ipython -i script.py``now behave the same as if they were passed to ``%run, so their variables are never hidden. A boolean config flag InteractiveShellApp.hide_initial_ns has been added to optionally disable the hidden behavior altogether. The default behavior is unchanged. The new function use_dill() allows dill to extend serialization support in IPython.parallel (closures, etc.). A DirectView.use_dill() convenience method was also added, to enable dill locally and on all engines with one call. The IPython console lexer has been rewritten and now supports tracebacks and customized input/output prompts. See the new lexer docs for details. pop(type_or_str) - remove a type (by type or string). Pass a second argument to avoid KeyError (like dict). All of the above methods raise a KeyError if no match is found. for_type(type_or_str) - behaves the same as before, only adding support for 'mod.name' type strings in addition to plain types. This removes the need for for_type_by_name(), but it remains for backward compatibility. Formatters can now raise NotImplementedError in addition to returning None to indicate that they cannot format a given object. Exceptions are no longer silenced when formatters fail. Instead, these are turned into a FormatterWarning. A FormatterWarning will also be issued if a formatter returns data of an invalid type (e.g. an integer for ‘image/png’). In notebook, Showing tooltip on tab has been disables to avoid conflict with completion, Shift-Tab could still be used to invoke tooltip when inside function signature and/or on selection. Equations, images and tables are now centered in Markdown cells. Multiline equations are now centered in output areas; single line equations remain left justified. IPython config objects can be loaded from and serialized to JSON. JSON config file have the same base name as their .py counterpart, and will be loaded with higher priority if found. 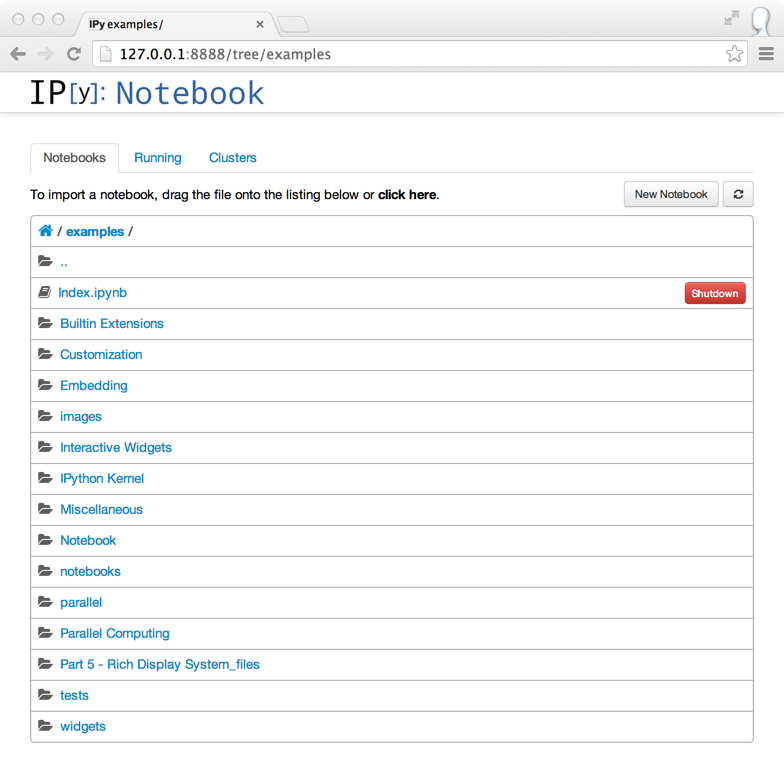 You can now run notebooks in an interactive session via %run notebook.ipynb. Print preview is back in the notebook menus, along with options to download the open notebook in various formats. This is powered by nbconvert. PandocMissing exceptions will be raised if Pandoc is unavailable, and warnings will be printed if the version found is too old. The recommended Pandoc version for use with nbconvert is 1.12.1. The InlineBackend.figure_format now supports JPEG output if PIL/Pillow is available. Input transformers (see Custom input transformation) may now raise SyntaxError if they determine that input is invalid. The input transformation machinery in IPython will handle displaying the exception to the user and resetting state. Added InlineBackend.print_figure_kwargs to allow passing keyword arguments to matplotlib’s Canvas.print_figure. This can be used to change the value of bbox_inches, which is ‘tight’ by default, or set the quality of JPEG figures. A new callback system has been introduced. For details, see IPython Events. Python 2.6 and 3.2 are no longer supported: the minimum required Python versions are now 2.7 and 3.3. The Transformer classes have been renamed to Preprocessor in nbconvert and their call methods have been renamed to preprocess. The call methods of nbconvert post-processsors have been renamed to postprocess. The module IPython.core.fakemodule has been removed. The alias system has been reimplemented to use magic functions. There should be little visible difference while automagics are enabled, as they are by default, but parts of the AliasManager API have been removed. We fixed an issue with switching between matplotlib inline and GUI backends, but the fix requires matplotlib 1.1 or newer. So from now on, we consider matplotlib 1.1 to be the minimally supported version for IPython. Older versions for the most part will work, but we make no guarantees about it. The pycolor command has been removed. We recommend the much more capable pygmentize command from the Pygments project. If you need to keep the exact output of pycolor, you can still use python -m IPython.utils.PyColorize foo.py. IPython.lib.irunner and its command-line entry point have been removed. It had fallen out of use long ago. The input_prefilter hook has been removed, as it was never actually used by the code. The input transformer system offers much more powerful APIs to work with input code. See Custom input transformation for details. The Azure notebook manager was removed as it was no longer compatible with the notebook storage scheme.